Carefulness and quality are crucial for us at Hoppekids. This is why we are proud to present a unique lifetime warranty on all beds in the PREMIUM collection. Lifetime warranty is your comfort and guarantee that the bed you buy is produced with the utmost care and consideration on security and durability. PREMIUM is the luxury collection from Hoppekids. The series provides higher comfort, even better security and durability, as well as an almost infinite selection of beds and accessories. The selection in PREMIUM gives you a lot of flexibility and makes it easy for you to find a bed that suits both your child and the child’s room. 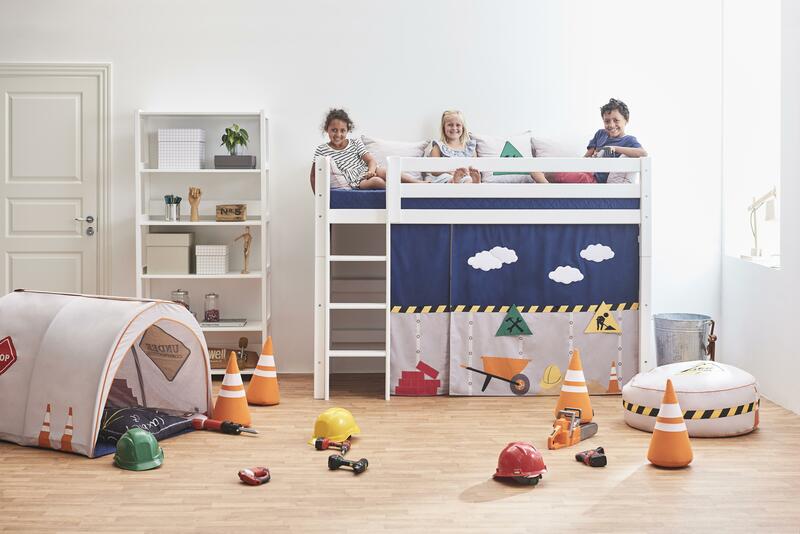 The quality of the bed and the great selection of accessories enable the PREMIUM bed to last for the entire childhood or to serve as a “hand me down” to younger siblings, without losing that special feeling of getting a new and personalized bed. You must register your purchase with Hoppekids no later than three months after date of purchase. As long as the normal warranty is valid, please contact the shop where you bought the bed. See all products included in the lifetime warranty here..
Read more about the warranty, how to register products and how to use the warranty below the picture. Which products are included in the warranty? All products that are a part of the PREMIUM collection are covered by the warranty; including slides, ladders and security rails. Click here for a complete list of included products. Textiles, mattresses and other products which are not a part of the PREMIUM collection is not covered by the warranty. The lifetime warranty is valid on all products bought after 1st of may 2017 and registered at Hoppekids no later than three months after the purchase. Please be aware that you will be asked to attach your receipt (as .pdf or .jpg) when registering your product. The lifetime warranty covers manufacturing errors. The warranty presupposes that the product has been assembled correctly in regards to the assembly manual and that all screws and similar have been tightened regularly. The lifetime warranty does not cover faults caused by misuse or regular wear or changes in the wooden structure or surface, including knots bleeding through the lacquer. The lifetime warranty is personal and cannot be transferred to someone else. It is only available for new products purchased after 1/5 2017 from a dealer approved by Hoppekids. How do I register my products? To register your PREMIUM product you must fill out the formula below. Please note that you must register your PREMIUM product no later than three months after purchasing the product. A valid receipt in .pdf or .jpg is needed to complete the registration. We cannot offer lifetime warranty without a valid receipt or proof of purchase. How do I make use of my lifetime warranty? To make use of your lifetime warranty, please fill out the formula below. N.B: Please contact the dealer you originally bought the products from if they are still covered by the normal warranty in your country. Hoppekids lifetime warranty is only available to products no longer covered by the regular warranty.